Kim Cooper's NMH book is currently sitting at no.11 on the chart. John Niven's Big Pink book is currently at no.23 - rising fast, but not fast enough for some. Honourable mentions go to Taylor and Ted, who both came close. Everybody else (including myself) was waaaaaay off. Hot damn! What a stroke of luck. 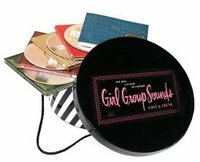 And I really wanted one of those Girl Group Sounds anthologies in the hat box. Thanks!